A quick-moving, early-morning barn fire at Springfield's Cavendish Game Birds has killed 20,000 quail and 30 pigs. Co-owner Rick Thompson says he was awakened about 5:30 a.m. Wednesday by an alarm indicating a power failure in the hatchery. When he opened the door of the barn to investigate, "There wasn't sound so much as smoke," he says. "Shortly after I got out, the barn just went." Though the barn — one of three — and silo burned to the ground in an hour, Thompson reckons that it was thick smoke that killed most of the animals, which represented about half of Cavendish's stock and all of its breeding birds. Several surrounding fire departments responded to the fire, and its cause is still unknown. Thompson says there was propane heat in the barn to keep the animals warm, as well as some shavings on the second floor of the barn that may have exacerbated the flames. Thompson and his brother, Bill, are lifelong poultry farmers, and it was Bill Thompson who began seriously farming and selling quail from his backyard more than 20 years ago. 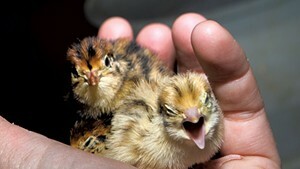 In 1988, the brothers bought the 75-acre farm that became home to Cavendish Game Farms; they supply thousands of Coturnix quail and their eggs each year to restaurants, food service operators and distributors throughout the Northeast, incuding Black River Produce. The farm's birds have been ubiquitous on Vermont restaurant menus. The Berkshire pigs that died in the fire represented a new venture for the company, says Rick Thompson. "Maybe it was a mid-life crisis. We'd been in the bird and quail business for so long that we planned on starting a pasture pork operation to try new things." The farm has about a month's supply of birds left, he adds, after which the Thompsons will shut down production to concentrate on rebuilding their breeding stock, egg operation and a new barn. They may be selling birds again by late summer. "One of the hardest things for us is going to be the down time. We have 15 employees, including my brother and myself," says Thompson. "They're all talented and experienced, and we're hoping we can take care of them as much as possible." For now, the staff is concentrating on giving its lost quail and pigs a respectful burial. "We'll gather the animals together and bury them," Thompson says.